Data Science Nigeria is now set for the second edition of its highly successful bootcamp aimed at bridging capacity gaps in Data Science for intermediate and expert-level Nigerian professionals and students, who are interested in machine learning, R or Python programming languages and statistics for advanced data analytics. This is part of an effort to make Nigeria the Data Science outsourcing hub for Africa before 2019 and to create 1 million new jobs during the next 10 years. The bootcamp is expected to run for four days between Thursday, 12 October and Sunday, 15 October 2017 in the Lekki axis of Lagos State. The bootcamp will include face-to-face teaching, virtual online classes, and a hands-on hackathon using the Kaggle platform. The sessions will be facilitated by leading local and international PhD-level data scientists, in the industry and the academia. Other leading experts expected at the conference are Dr TunjiAdegbesan of Gidimo, NadayarEnegesi of Andela, Dr Sulaimon Afolabi, BabajideOgunsanwo of Leadership-By-Data, Dele Tejuosoof Wifi Combat Academy, Steve Babaeko of X3M Ideas, OluseunOnigbinde of BudgIT, NgoziDozie ofOneFi, AdetayoBamiduroMAX.ng. In addition, the summit will showcase some experts like Shingai Manjengwa of Fireside Analytics Canada, Samuel Odeloye, Dr Jacques Ludikand Emeka Okoye of Cymantiks. The bootcamp and the summit are supported by Microsoft, 4Afrika, Interswitch, Keoun.ng, KPMG, OneFi, ProShare Nigeria,Nigerian Bureau of Statistics, DataCamp, BusinessDay, TechCabal, CFATech.ng andthe Machine Intelligence Institute of Africa. 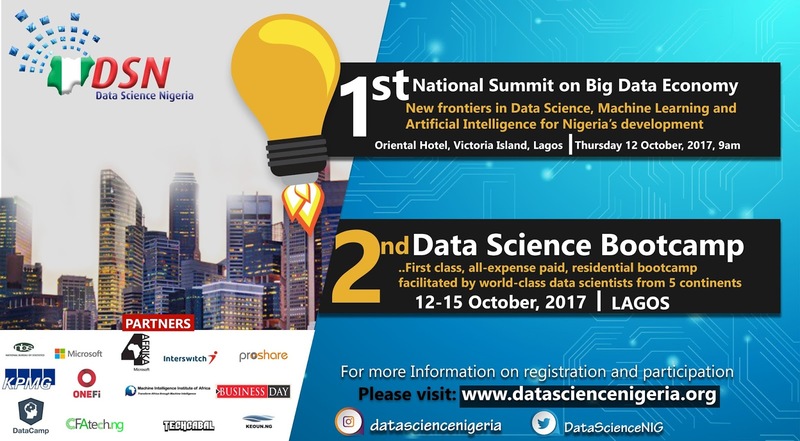 Data Science Nigeria is a non-profit initiative of MTN’s executive, Bayo Adekanmbi.It is spurred on by a compelling drive to raise a new generation of world-class data scientists and knowledge entrepreneurs who will set up data science-based businesses and attract foreign exchange to Nigeria. This will position the country to access its fair share of the over $125 billion Big Data analytics market as foreign currency earnings.